Setting up Activity Streams within the Activity section will allow you to add an automation to send you notifications when your contacts (that have been converted by Jumplead) return, or even view certain pages. The Prospects tab within the Activity section shows a list of the activity by prospect organisation and contacts that have been identified through completion of a Jumplead conversion form or clicking through from a Jumplead email campaign. The dropdown menu to the right of each prospect contains short cuts to the tabs on the company or contact’s profile page. 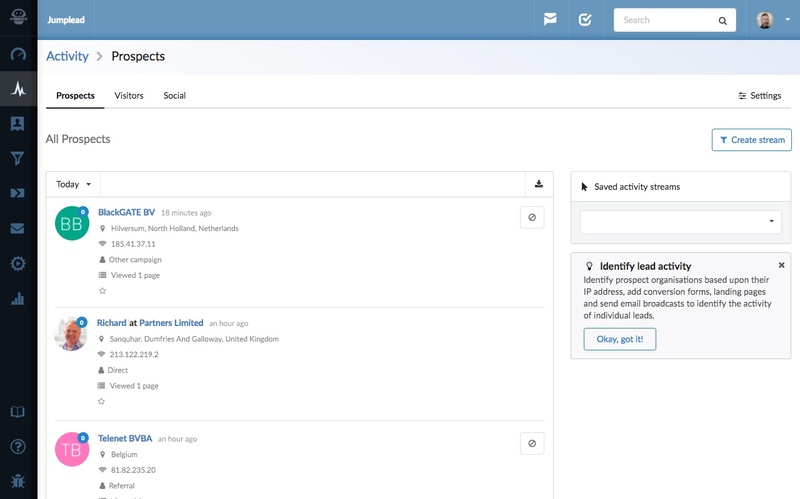 You can also move the prospect organisations to the visitors tab (by adding them to your Ignore list from the dropdown menu) if they are not of interest. The Visitors tab shows activity from people that are connecting to the internet from a known internet service provider and have not previously completed a conversion form, we classify these people as visitors as they have not yet become part of your sales funnel.